Drainage | Carolina Greenscapes, Inc. Drainage | Carolina Greenscapes, Inc. Does a muddy and messy yard prevent you from enjoying time outside? We can transform your yard into a dry, beautiful space that you can use all year long. Our goal is to identify the source of your drainage problem and install a proper drainage solution. Don’t treat your drainage problems with sump pumps or interior drains, let us find the problem and fix it the right way. 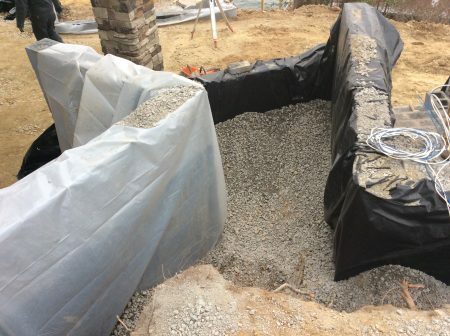 We install french drains that channel rainwater through an underground trench that redirects surface water and ground water away from the affected area. This will make your yard dry and usable again. If you have a low point in your yard, you may want to consider a catch basin. It’s a great and effective way to collect water and properly direct it off your property. Excess water from your downspouts can lead to damage and soggy yards. A simple fix is to re-route the excess water from your downspout away from your home’s foundation. These pipes are installed underground and are a great solution for your home. Not all properties are alike and your drainage solution needs to be tailored to your needs.